Astronomers have turned to an unexpected place to study the evolution of planets -- dead stars. Observations made with NASA's Spitzer Space Telescope reveal six dead "white dwarf" stars littered with the remains of shredded asteroids. This might sound pretty bleak, but it turns out the chewed-up asteroids are teaching astronomers about the building materials of planets around other stars. So far, the results suggest that the same materials that make up Earth and our solar system's other rocky bodies could be common in the universe. If the materials are common, then rocky planets could be, too. "If you ground up our asteroids and rocky planets, you would get the same type of dust we are seeing in these star systems," said Michael Jura of the University of California, Los Angeles, who presented the results today at the American Astronomical Society meeting in Long Beach, Calif. "This tells us that the stars have asteroids like ours -- and therefore could also have rocky planets." Jura is the lead author of a paper on the findings accepted for publication in the Astronomical Journal. Asteroids and planets form out of dusty material that swirls around young stars. The dust sticks together, forming clumps and eventually full-grown planets. Asteroids are the leftover debris. When a star like our sun nears the end of its life, it puffs up into a red giant that consumes its innermost planets, while jostling the orbits of remaining asteroids and outer planets. As the star continues to die, it blows off its outer layers and shrinks down into a skeleton of its former self -- a white dwarf. 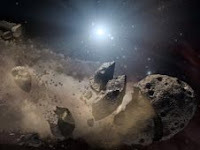 Sometimes, a jostled asteroid wanders too close to a white dwarf and meets its demise -- the gravity of the white dwarf shreds the asteroid to pieces. A similar thing happened to Comet Shoemaker Levy 9 when Jupiter's gravity tore it up, before the comet ultimately smashed into the planet in 1994. Spitzer observed shredded asteroid pieces around white dwarfs with its infrared spectrograph, an instrument that breaks light apart into a rainbow of wavelengths, revealing imprints of chemicals. Previously, Spitzer analyzed the asteroid dust around two so-called polluted white dwarfs; the new observations bring the total to eight. "Now, we've got a bigger sample of these polluted white dwarfs, so we know these types of events are not extremely rare," said Jura. In all eight systems observed, Spitzer found that the dust contains a glassy silicate mineral similar to olivine and commonly found on Earth. "This is one clue that the rocky material around these stars has evolved very much like our own," said Jura. The Spitzer data also suggest there is no carbon in the rocky debris -- again like the asteroids and rocky planets in our solar system, which have relatively little carbon. Jura says the real power of observing these white dwarf systems is still to come. When an asteroid "bites the dust" around a dead star, it breaks into very tiny pieces. Asteroid dust around living stars, by contrast, is made of larger particles. By continuing to use spectrographs to analyze the visible light from this fine dust, astronomers will be able to see exquisite details -- including information about what elements are present and in what abundance. This will reveal much more about how other star systems sort and process their planetary materials. "It's as if the white dwarfs separate the dust apart for us," said Jura. Other authors are Ben Zuckerman at the University of California, Los Angeles, and Jay Farihi at Leicester University, England. This research was funded by NASA and the National Science Foundation. NASA's Jet Propulsion Laboratory, Pasadena, Calif., manages the Spitzer Space Telescope mission for NASA's Science Mission Directorate, Washington. Science operations are conducted at the Spitzer Science Center at the California Institute of Technology, also in Pasadena. Caltech manages JPL for NASA.